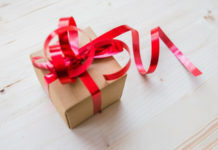 It’s Father’s Day again and we’ve put together a fun and practical list of gifts for dads of nurses. 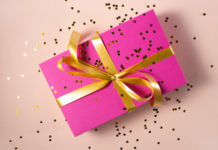 If you’re tired of picking yet another tie or World’s Best Dad” coffee mug, why not give him something unique this year? Only a few privileged dads can wear this special shirt. 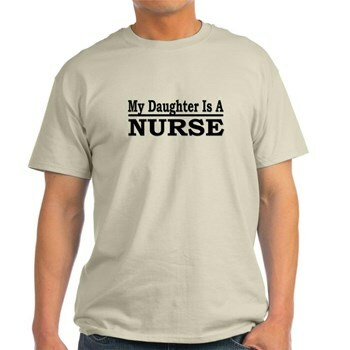 After all, how many dads can actually boast that THEIR daughter is a nurse? Very damn few. So, get your Dad this shirt and let him boast to his heart’s content. This comfy and relaxing shirt is made of 100% cotton and is available in three colors – ash grey, light blue, and natural. It’s a standard fit tee with a crew neckline. This slim and portable blood pressure wrist unit is a good gift idea for dads with health problems who need their blood pressure constantly monitored. With over 6,000 high customer reviews, we chose the best and most popular of the lot. 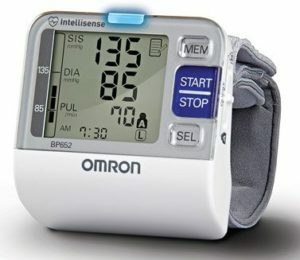 The Omron 7 Series Wrist Blood Pressure Monitor has got a lot of useful features like automatic activation when your wrist is at heart level, alerts when readings exceed normal levels, two user modes, irregular heartbeat detector, and a fantastic memory storage. 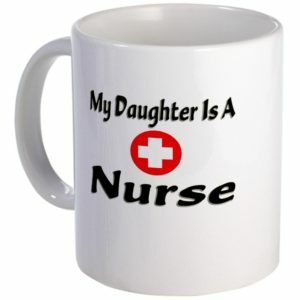 If your dad loves a cup of coffee or tea in the morning, this “My Daughter is a Nurse Mug” is another gift idea for your dad. A shirt is worn only now and again, but a coffee mug gets used everyday. More visibility means more fun times! This ceramic mug is standard size and is dishwasher and microwave safe. 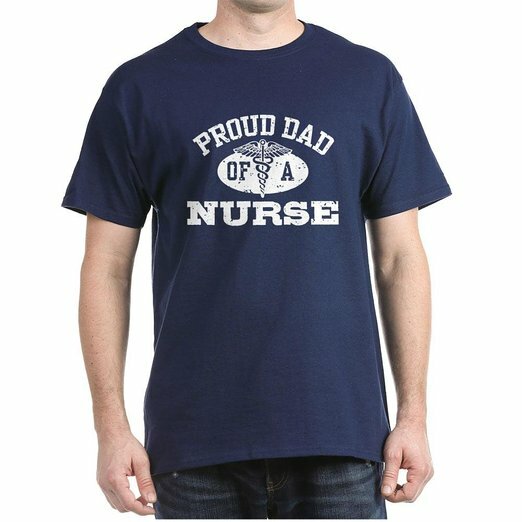 This “Proud Dad of a Nurse Shirt” is one of the best gifts for dads of nurses. 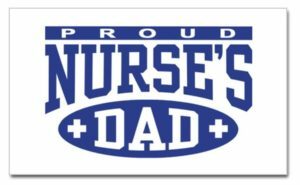 Who won’t be proud to be a dad of a nurse? Their little girl has grown up and has taken one of the noblest professions in the planet! 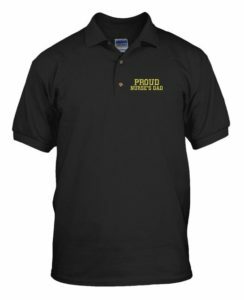 This proud dad shirt is available in a wide array of colors including green camo. It is 100% preshrunk cotton with a standard fit and a crew neckline. 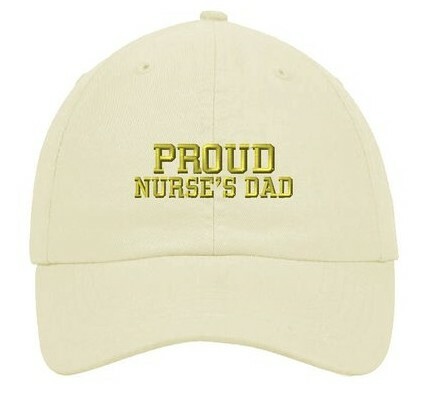 We love this “Proud Nurse’s Dad Cap”. It’s more discreet than a proud dad shirt but still sends the same proud message across. This gift idea is perfect for dads who can’t be caught outside without a cap on their heads. 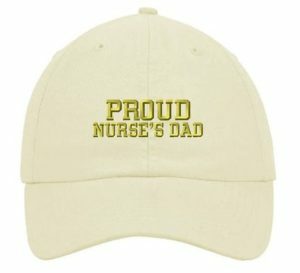 This proud dad cap comes in six colors including the usual colors like black and navy, and more unusual colors like pink and khaki. This quality, breathable, and adjustable baseball hat is guaranteed to be a favorite. 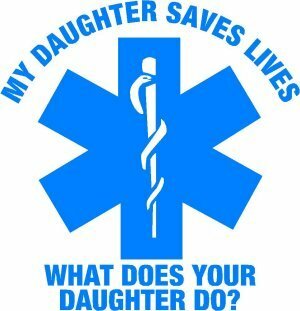 My daughter saves lives. 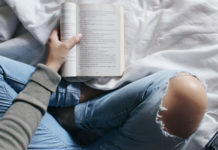 What does your daughter do? Do you have a dad who is superlatively proud of you? Does your dad tell every person he meets what a noble job you have? 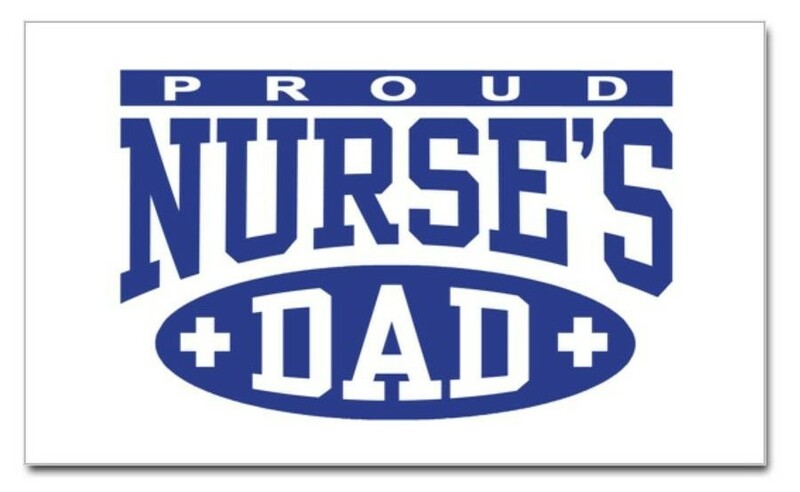 This decal is one of the best gifts for dads of nurses. The gesture might be tongue-in-cheek or might be in support of an actual boast. Whatever the reason, this sticker will look great outside of your dad’s car or window. This Firefighter sticker is made by 3M so you’re ensured quality. It is easy to peel, apply, and peel off. This polo shirt is for the proud dad of a nurse AND the avid golfer. You hit two birds with one stone with this fun yet practical shirt. This shirt is sure to be the topic of conversation at your dad’s next golf game. Available in black, ash, navy and white, the lettering is embroidered and the cloth is made of 100% pre-shrunk spun cotton. 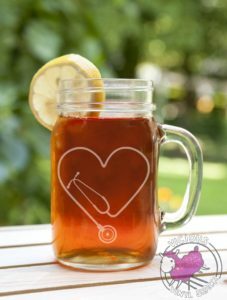 This 16 oz Mason Jar Mug has an awesome stethoscope heart cutout. Just by this symbolic icon, your dad is sure to remember you as he sips his delicious iced tea in the sun. This mug is hand-etched and will neither peel nor fade. It is dishwasher safe too! At barely four dollars, this proud dad rectangle sticker can be added to whatever special gift you bought your dad this Father’s Day. 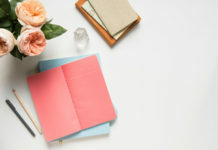 This sticker is very versatile and can be placed anywhere from notebooks to car windows. It comes in transparent or opaque and is guaranteed no bleeding in the rain and no fading in the sun. It is 3 x 5 in size. 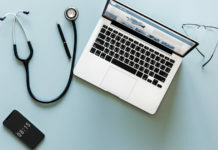 While we sometimes suffer from irritating patients or patients’ relatives or get uber tired from work, we know that our Dads are very very proud of our chosen profession. They support us and have our backs. So, don’t forget to prepare something special for your dad today. 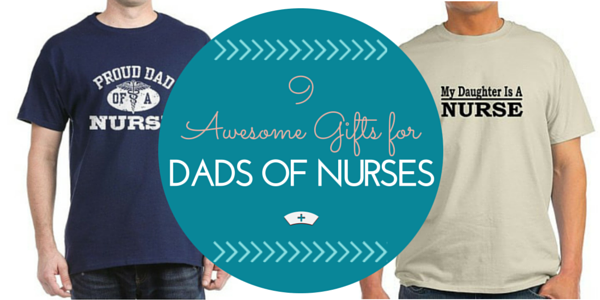 It can be any of the gifts for dads of nurses above or any gesture of love from you!